Donate to CHiPs for Kids! 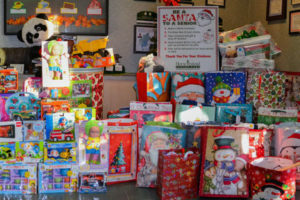 Carmichael Water District (District) is participating in the California Highway Patrol’s Annual CHiPs for Kids Toy Drive. You can help give a happy holiday to children in need by dropping off a new unwrapped toy at the District office between November 17th and December 13th. Every toy makes a difference! Carmichael Water District (District) is participating in the Home Instead Annual Be a Santa to a Senior Program. You can help give a happy holiday to lonely or isolated seniors in our community. Stop by the District office to pick up an ornament with a senior’s gift request from our tree. Purchase the requested gifts and place the ornament with the unwrapped gift in our designated box between November 17th and December 13th.